Generic Codex template in HTML, available for download. Toronto Games Day 2002 photo essay. Warhammer 40,000, also known as Warhammer 40k, is a miniatures battle game set in Games Workshop's grim and gothic 41st millennium. It, along with its Warhammer Fantasy stablemate, is the most successful line of miniatures games ever produced with almost twenty years of continuous production. The Games Workshop catalog lists literally hundreds of Warhammer 40k miniatures produced by their Citadel Miniatures division to a high quality 28mm scale. Detail on the miniatures is very good to exceptional, though proportioning exaggerates the hands and weapons somewhat for dramatic effect. Vehicle models from Citadel Miniatures have always emphasized ease of assembly and durability on the game table, but recent releases have also shown a wealth of detail and a clarity of line that rivals some lines of historical model kits. 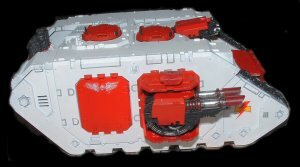 The current trend also goes to including moving parts and interior detailing which add to the enjoyment both of playing the game and of building the model. For experienced model-makers, Forge World produces resin cast vehicles and monsters for Warhammer 40k to an excellent level of detail and quality. Forge World miniatures draw heavily from modern and historical sources to bring a feel of authenticity to the gaming table. Some miniatures are executed so well that they would look at home in museum displays. Along with this vast field of ready-to-assemble kits, Games Workshop encourages players to customise their miniatures. As players gain in modeling and painting skill, each can develop their armies with a look all of their own. There is a vast body of background material for the game, with continuous storywriting since the First Edition (subtitled Rogue Trader) was published in 1987. The depth of literature is so great that it has spawned an extensive line of novels, which have in turn inspired new games material. 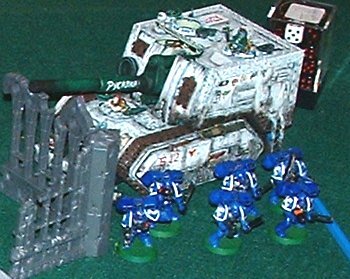 This vast collection of "story" history makes Warhammer 40k unique and is a great part of its appeal. Games Workshop's monthly glossy magazine White Dwarf covers new rules, fiction, and pictorial articles for Warhammer fantasy and Warhammer 40k as well as coverage of their other games and sponsored events. There are also bi-monthly magazines of short fiction, several lines of comic books set in the Warhammer 40k universe, and quarterly magazines for it and for spin-off miniatures games such as Necromunda and Battlefleet Gothic. The Warhammer 40k rules set is now in its Third Edition, greatly simplifying game play while retaining a good flavour of close-quarters action. In addition, the rules include a points system allowing players to match each other in tournament play without having to coordinate in advance... each player simply "builds" an army according to the points system and their army's table of organization, then both can begin playing immediately. It is this system, along with the simplicity and flavour, that makes it the favourite miniatures game of our NWLGG membership. "Warhammer 40,000", "Warhammer 40k", and the Warhammer 40,000 wordmark are all ® Games Workshop, with all rights reserved by them. Use of these marks on this page is solely for reference purposes and does not constitute an endorsement by Games Workshop, nor should this page content be considered "official" or "approved" in any way.